Is this the right way to config? 2) Delete all your entries at "Settings | PHP | Servers" -- the one you show on screenshot is NOT configured properly ("Host" field has to be host and not URL). When doing #3 IDE will help setting it up. Thanks for responsing. I tried those steps and I still cannot debug with localhost here is my screen shot. 1) OK -- I see that xdebug is installed. But -- is it configured correctly? 2) If you are trying zero-config approach (as I have suggested) --- why do you show me your Run/Debug configurations (which are simply not required for such approach)? I'm having similar issues than OP. Some serious debugging issues, I mean. When I try and use the zero configuration mode, I get no reaction from phpstorm in any way. When I try to use the debug configuration, I get the phpstorm to connect to page, but no breakpoints are respected. Not even "Break at first line.."
I got this working briefly (thou I have no idea as to how, but some config worked with zero config), but not recently after latest update. I'm pretty sure that there's something wrong with my configs, but for the life of me I can't figure out what it is. This is REALLY important thing form me to get working. Your xdebug is configured correctly. Now, your "does not work" does not help here at all as it provides no info on what could possibly be wrong, unfortunately. As I understand, the IDE and actual web server are located on the same computer/OS (i.e. nothing is virtual/remote)? It's good idea to clear idea.log before doing all that (smaller log that contains only relevant info -- no "junk" from previous sessions) -- "Help | Show log in..."
Some basic screencast (or, at very least, a bunch of screenshots of whole screen) would be extremely handy. Ok, I thought that xdebug was configured properly. 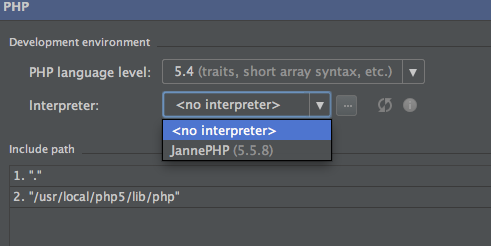 I sort of understand that "does not work" isn't very helpful, but that's what I'm getting from phpstorm. Everything seems to be fine, but it's just not working. And yes, this is local environment, with OSX Mavericks and homebrewed php 5.5.8. 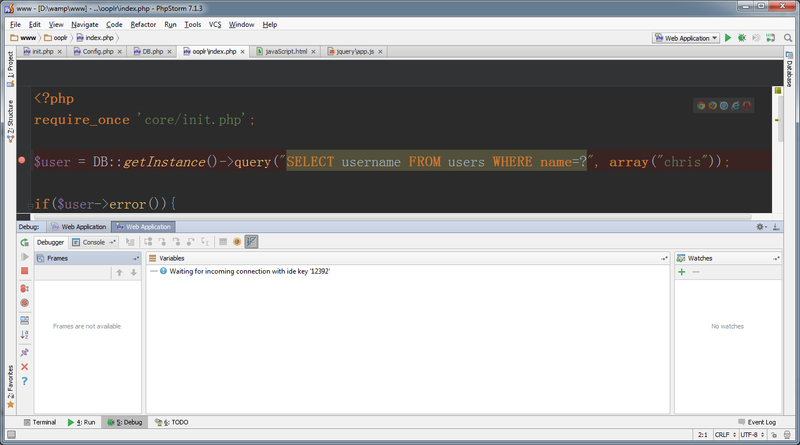 I configured phpstorm logging as you told, and here's the result. I emptied that file before running anything. 2014-06-27 15:29:21,831 [ 2502] INFO - api.vfs.impl.local.FileWatcher - Native file watcher is operational. 2014-06-27 15:29:25,071 [ 5742] INFO - om.intellij.util.ProfilingUtil - Profiling agent is not enabled. Add -agentlib:yjpagent to idea.vmoptions if necessary to profile IDEA. 2014-06-27 15:29:25,119 [ 5790] WARN - j.ui.mac.MacMainFrameDecorator - no url bundle present. 2014-06-27 15:29:29,734 [ 10405] WARN - j.ui.mac.MacMainFrameDecorator - no url bundle present. 2014-06-27 15:29:32,079 [ 12750] WARN - j.ui.mac.MacMainFrameDecorator - no url bundle present. About screenshots, what screens you need to get info you need to help me? I took some random screens, maybe there's something for you to work with..
1) Have you tried to debug? The PhpStorm's log shows nothing. Please describe (in details) how you debug (what do you you click etc -- step by step). 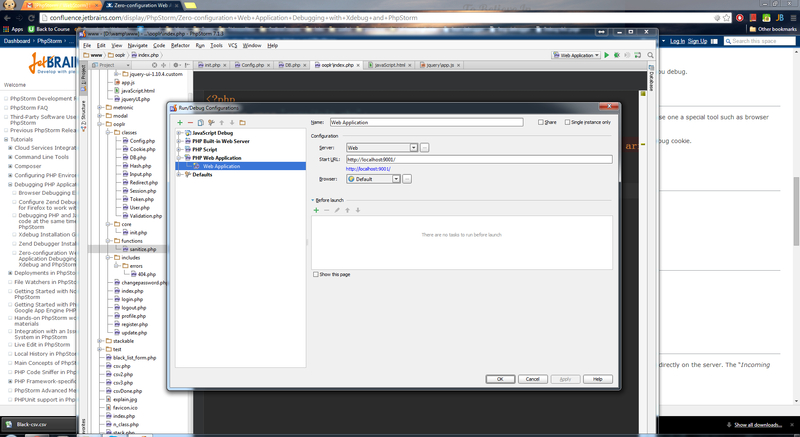 Restart IDE, open your project (restart browser if desired) and start from there. 2) The "zero-config approach" suggests that it will create entry at "Preferences | PHP | Servers" for you (will show dialog box when debug connection will be established). I see that you have made such entry yourself. There is nothing wrong with it ... except that is it configured WRONGLY. Why .. why people are trying to put "http://my-domain.com/" kind of text in "Host" field? Why? "Host" (domain name) is NOT the same as "URL". It should be just "my-domain.com" without protocol or port numbers -- even help page says that: "Host: In this text box, type the name of the host where the target application is deployed." 3) In any case: #2 can be ignored .. since IDE does not receive any debug connections (as you have said yourself -- xdebug log is empty). This means that xdebug does not see your "debug this" flag (usually a cookie or GET/POST parameter) -- this is what bookmarklets or browser extension does -- it sets such cookie so it will be sent with next page request which xdebug will see and act accordingly. You may need to restart Apache to have changes in php.ini to have effect. Hello, I never start a post elsewhere. This is my only post. Anyways Here is my phpinfo for xdebug. I did use zero-configure. It didn't work either. Another question: why 8080 ? Is it how you enable it? The reason i set 8080 is because my skype is actively listen to port 80, so i switch it to 8080 to resolve the conflict. sorry for some newbie questions, I just purchased phpstorm and I am not familiar with the settings. Is it how you enable it? The reason i set 8080 is because my skype is actively listen to port 80, so i switch it to 8080 to resolve the conflict. And what it has to do with xdebug? The port on which you run your Apache does not matter -- AT ALL. Please -- read the xdebug manual (, ) about what xdebug.remote_port does. The links I gave you (2 first links) in my original reply -- they are enough to have it working on localhost. So far it has nothing to do with PhpStorm. So far it's just about configuring xdebug to be able to debug. Umm... Yes? How would I know that debugger isn't working if I hadn't tried it? Just a tad condesending? Ok, restarted IDE and Firefox. Removed old booklets, and added ones from the link you provided. Open local dev site for debugging. Click newly created bookmarklet to start debugging. 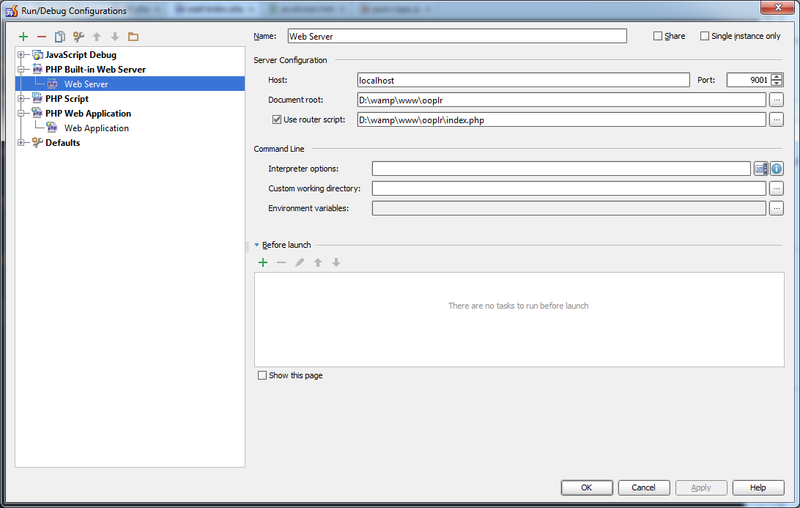 Refresh page and hope PHPSTORM catches breakpoint. Nothing. File being debugged is index.php of Drupal installation. Yes, I've tried just about every configuration imaginable to me to get this work, to no avail. If it is configured compeletely WRONG, I'm inclined to think there IS something wrong with it. My advice to the writer of those help pages would be that maybe it would be worthwhile to mention that the protocol part breaks thing up if it does so. While it may because I don't understand something in the help pages, if you find yourself writing something like "why ppl are trying..." often, the answer might just be that ppl are not getting the info as intended from those help pages. I will try this next. And yes, I have restarted Apache every time I've changed the php.ini or web server configuration. IMHO debugging PHP shouldn't be this difficult. Setting that xdebug.remote_autostart=on had no effect. No logs, no debug, nothing. It's as if xdebug is non-exestent for PHPSTORM debugger. Is there any configs to check apart from the ones mentioned here. It can't be because of browser, because I've tried with Chrome & Firefox and neither is working. Same with profiler. And I had xdebug + PHPSTORM working just fine on my laptop before SSD on that died and I had to reinstall everything. Since then this hasn't been working on any machine. This main machine is 2012 iMac running Mavericks, laptop is 2013 MBP running Mountain Lion. Same PHPSTORM + xdebug versions. That is the problem -- xdebug always writes into log (if configured so) BEFORE establishing connection. And this option -- remote_autostart -- tells xdebug to attempt to debug every single script regardless of how it was initiated. So .. I would expect to see something there. 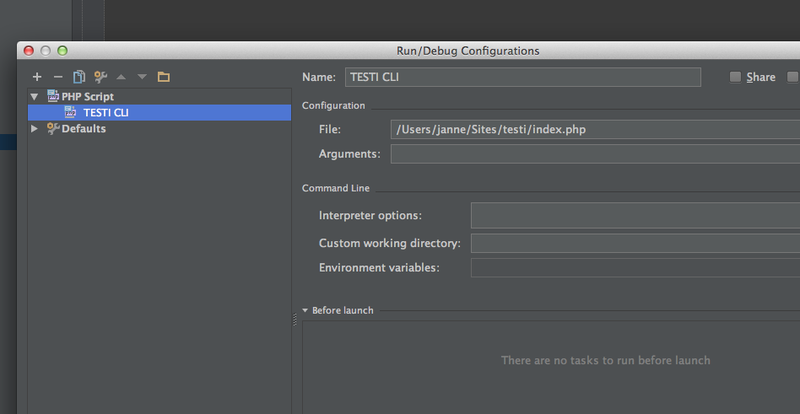 So far it's about xdebug only -- if xdebug is unable to initiate .. then PhpStorm is not even get contacted. will it do any different if you trigger debugging programmatically by placing xdebug_break(); into your code? try to debug it in CLI mode (Run/Debug configuration of "PHP Script" type). IDE will provide all parameters required as parameters to PHP interpreter. if it works -- try debugging it via browser. On Linux/Mac you may have dfferent php.ini files for web/cli modes (which one is used is available in the header of php_info() output -- so check xdebug settings with "php -i" for cli mode. Considering that remote_autostart does not help -- it sounds like xdebug issue then (whatever it may be). I would definitely recommend trying another xdebug build. You do not need any configs if you do Zero-Config approach. Any way: if you are talking about entries in drop-down box then they can be edited/removed by choosing "Edit Configurations.." options in that drop-down or "Run | Edit Configurations...". Could you also provide the top part (all that goes before individual modules settings) of the php_info() output, please. No change wheter or not I have breakpoint in code. So something IS happening here after all. 1) Do you still have any entries at "Preferences | PHP | Servers"? If so -- please delete and let IDE help setting it up again. 2) Please try to debug simple script first (CLI mode; then via web). Once able to debug -- move to real site. 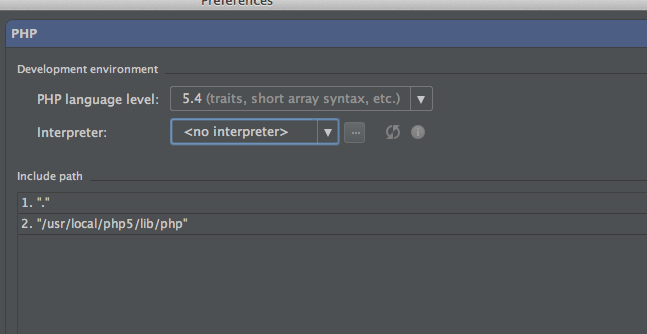 3) Your log has nothing about interaction with PhpStorm. Sounds like PhpStorm completely ignores connection. Could you please provide log from PhpStorm side? But before that -- make sure that it is PhpStorm who listens on xdebug port (TCP 9000 by default). netstat should help here (after that "phone handle" icon is activated). I deleted existing, but IDE doesn't do anything. Not sure I understand how it would help me out here. Don't undestand this either.. I have no idea how to debug from cli. It appears to be using same xdebug config than the "normal" mode. Tried this, didn't work. Want to help out understanding how this should work? I also created an blank phpstorm project out of that simple script. No debugger initially present, but after I chose interpreter, I was able to set that zero config debugging, but nothing happens. No server present for that new project. netstat | grep PHPSTORM gives nothing, same with lower case. Neither does netstat | grep 9000. 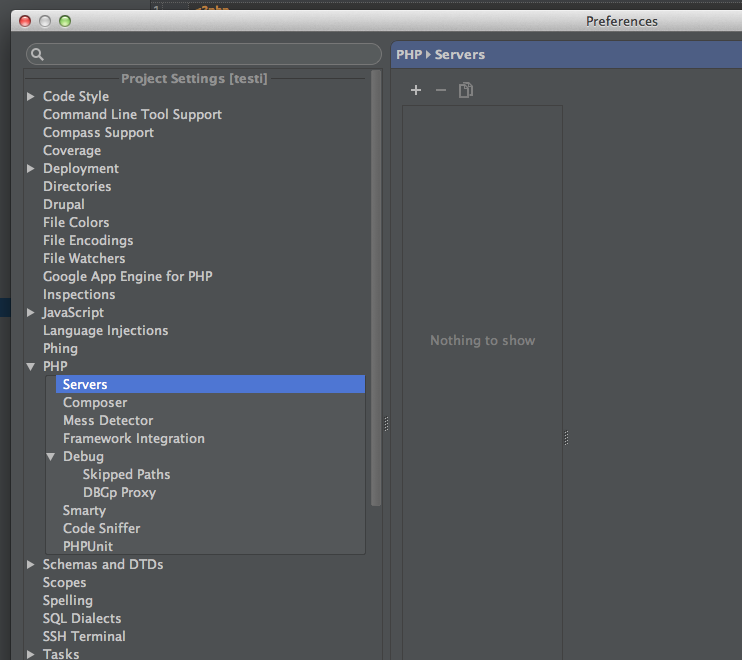 So apparently PHPSTORM isn't listening at all? And I do have that green phone lit. Hmm. This is getting interesting. Could I have missed something here? 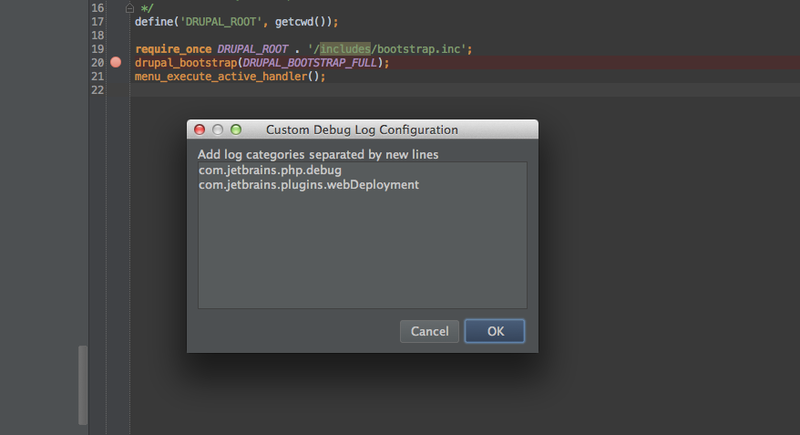 Oh, and logs at all from PHPSTORM. Don't undestand this either.. I have no idea how to debug from cli. 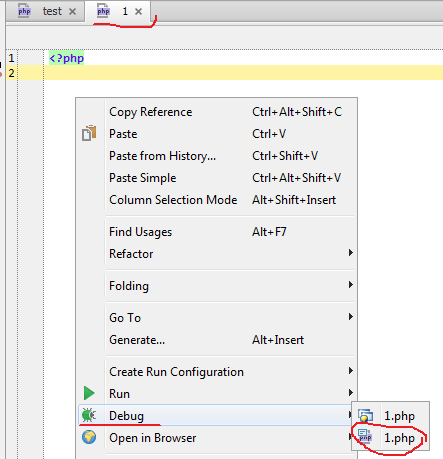 Create Run/Debug configuration of "PHP Script" type and use Debug in that drop-down box in toolbar while this entry is selected. You do not need to use "phone handle" icon / Zero-Config when debugging CLI scripts. 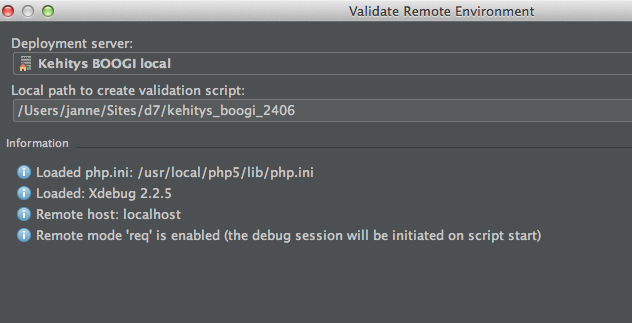 Just invoke debug from PhpStorm. xdebug_break(); is prgrammatic breakpoint -- it tells xdebug to break at this line regardless if breakpoint is set or not. 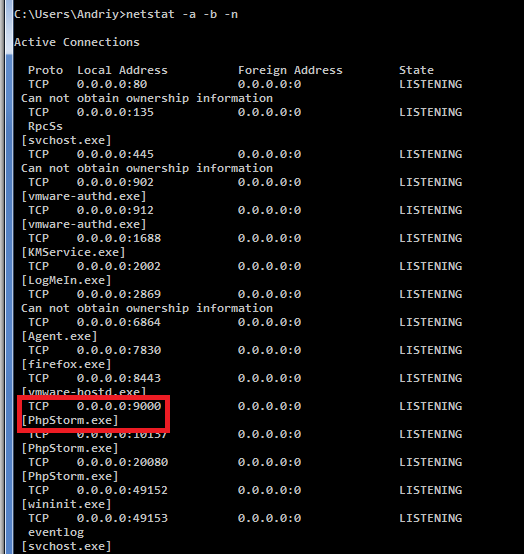 I'm not netstat expert, especially since I'm not using Mac (I'm on Windows) .. so cannot help too much here. But this is what I see when PhpStorm's "phone handle" icon is ON. 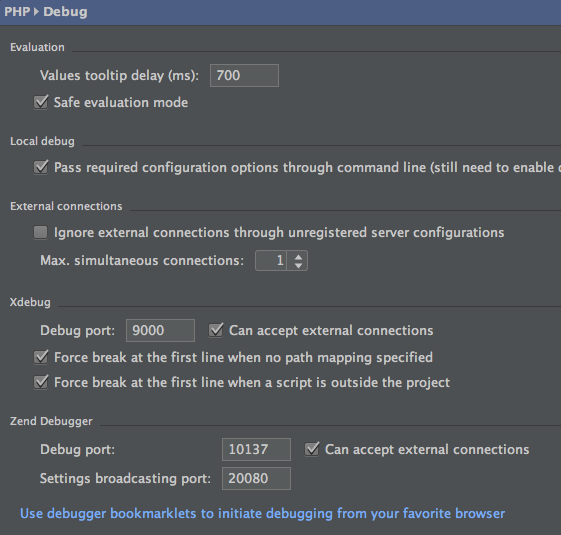 The port used fro xdebug by PhpStorm can be changed at "Preferences | PHP | Debug" -- it is set to default 9000 by default. In one of your original screenshots it was set to 9000 already. Maybe you do not see it there (in netstat) because of firewall issue. Do not know -- not Mac user unfortunately. Nope. I have tried debugging after I deleted previous entry, but that PHP/Servers is empty. IDE hasn't prompted anything or added to that. Don't know why. Nothing. No debugging even from here. Perhaps it's time to accept that xdebug is broken. Yeah. I should have something similar, but nothing about phpstorm or port 9000. Running out of ideas? I know I have a long time ago. PhpStorm does not see incoming debug connection (for whatever reason). Hence the helper popup does not show up. Nothing. No debugging even from here. Reinstall PhpStorm (the app -- leave settings intact). Try v7 as well as v8 EAP build. Delete ALL settings (backup them first). 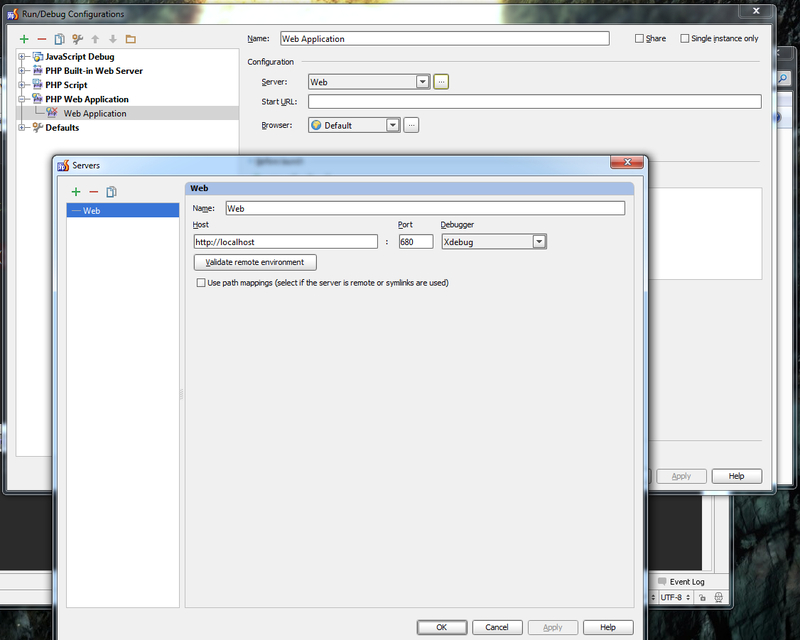 See if brand new settings (with no 3rd party plugins installed) will do any different. You can then restore old settings if desired. Double check your firewall -- it's odd (for me, not Mac user) that after activating "phone handle" icon the netstat does not show PhpStorm listening. Activate "phone handle" icon .. and try to connect to PhpStorm on that port via telnet. See if you can connect at all (your xdebug log shows that it connects .. but to where?). Try with that icon enabled as well as disabled. If it works with disable .. then some another service is listening. Yeah, thanks. I'll look into this when I get a second. But yes, I will definetly need this to work, so I'm all up for TeamViewer session if this doesn't get sorted soon. But I have to some actual work atm, so I'll get back when I've tested sme more.